Kevin Lim/The Strait Times/Handout/GettyNorth Korean leader Kim Jong Un with President Donald Trump at the Capella Hotel in Singapore, June 12, 2018. President Donald Trump in a late-night tweet praised North Korean leader Kim Jong Un after his regime provided the US with what are believed to be the remains of US service members who died during the Korean War era. Trump also appeared to suggest there would be a second meeting with Kim, after the two leaders met for the first time during their summit in Singapore on June 12. “Also, thank you for your nice letter – l look forward to seeing you soon!,” Trump said in the tweet. However, identifying the remains could take years to accomplish, and in previous instances, North Korea reportedly turned over the remains of animal bones, according to Daily Mail report published in June that cited the memoirs of a North Korean diplomat who fled to South Korea in 2016. Around 5,300 US remains are still believed to be in North Korea. 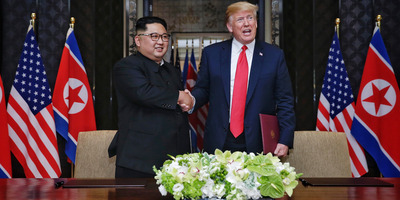 During the summit, the Korean Central News Agency, North Korea’s state-run propaganda outlet, claimed that Kim invited Trump to visit Pyongyang at a “convenient time” and that Trump had invited Kim to the US. “The two top leaders gladly accepted each other’s invitation, convinced that it would serve as another important occasion for improved DPRK-US relation,” KCNA said in their propaganda dispatch. Speaking to reporters at the summit, Trump said that he would “absolutely” invite Kim to the White House in Washington D.C. If they were to happen, either of the trips would mark a significant shift in US-North Korea relations, particularly after the bellicose rhetoric the two leaders exchanged in 2017. A Trump visit to Pyongyang would mark the first time a sitting US president visits North Korea.